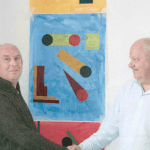 Clare Arts Office has long been to the fore in commissioning commanding and dynamic new work. In 2013 the Arts Office commissioned ‘The Clare Concerto’ from composer Dave Flynn to be performed by the unique Clare Memory Orchestra (CMO). 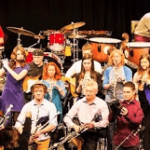 Flynn, the founder of the CMO has combined some of Ireland’s leading traditional and classical musicians. Launched in County Mayo in July 2014, this was an ambitious EU project including partners in the UK and Catalonia. 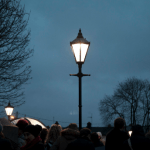 It was a contemporary visual and digital art project consisting of new temporary outdoor artworks on walking and cycling routes that used to be railway lines, by three international artists, Aideen Barry(IRE) Xevi Bayona(CAT) and Noah Rose (UK). 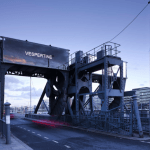 Dublin Ships was commissioned by Dublin City Council in partnership with the Dublin Port Company and the Dublin Docklands Development Authority as part of the Dublin City Public Art Programme, Strand 2 – Interaction with the City. The work by Cliona Harmey is located on the Scherzer Bridges at North Wall Quay. Evening Echo is a jointly commissioned Public Art work by Cork City Council Arts Office and Parks Department, the National Sculpture factory and New Zealand-based artist Maddie Leach. Now in its third year, the project continues to gather support from the Cork Hebrew Congregation, Cork City Council, Bord Gáis and its local community. 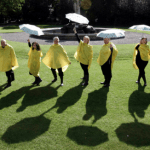 Produced by Mayo County Council in partnership with the Linenhall Arts Centre, FIND was an exciting artistic venture presenting a series of temporary artworks/installations/events in and around the town of Castlebar. The Linenhall Arts Centre acted as a central focus for participating artists and audience alike. The Landmark public art programme, involving seven commissions, including a ground breaking arts and science collaboration with Cleary+Connolly, was launched in 2012. 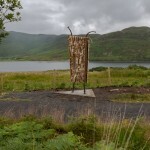 The commissions included permanent bronze sculptural works by Elaine Griffin, along side installations that challenge visual perception by Cleary +Connolly. 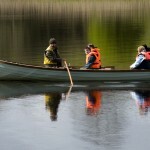 This groundbreaking unique project, commisioned by Carlow County Council was brought about through Roche’s socially engaged practice. The seed of the idea was sown by Roche and we embarked on a journey together; recognising that in order to make it happen we needed to create strong local relationships, key partnership buy-in and community ownership from the outset. In 2007 the Carlow Local Authorities Public Art Working Group began to work with specialist curators and artists across art forms such as the visual arts, theatre, music etc in order to get an insight into what makes ‘good public art’ that engages communities whilst also creating something artistically unique. 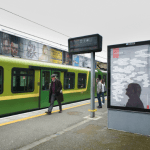 Travelogue was commissioned by the National Transport Authority in partnership with Dublin City Council, Fingal, Dún Laoghaire Rathdown and South Dublin County Councils. 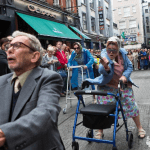 Travelogue was a multi-dimensional temporary public artwork which celebrated the human drama which is played out on the public transport system in Dublin every day. Things We Throw Away was commissioned by Dublin City Council as part of the Dublin City Public Art Programme, -Strand 2 – Interaction with the City. 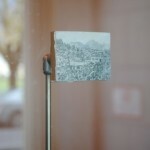 Strand 2 was an open call for proposals in any artform and which could include temporary, time-based or permanent art.